Your used goods can change a child's life. 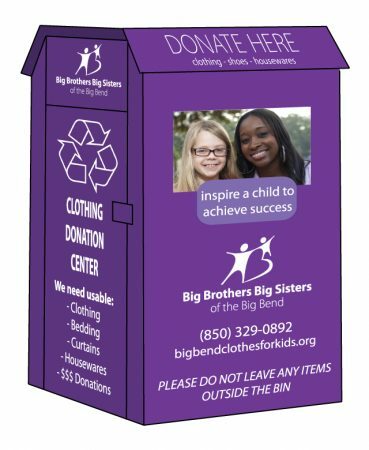 We are now collecting donations of clothing, bedding, shoes, purses, and household items with 54 purple donation bins in the Big Bend. The items collected provide a revenue source that allows us to match more at risk kids in our community and helps us create new jobs. We are committed to providing vulnerable children with positive adult role models, giving them the opportunity to achieve great things. Your donation contributes to this goal by enabling us to provide our mentoring to more youth from our waiting lists. Thank You for your support. And thank you for helping our community re-purpose useful items and keeping good "stuff" out of landfills. Scroll down for a list of Purple Bins by zip code.